Welcome to the H2O House Washing website I am a sole operator and do all the work myself I've been operating for over 20 years and I offer a reliable personal service along with competitive prices. I would be more than happy to quote on any of my services I hope you enjoy browsing through my website and please contact me if I can be of service. If you are selling your home, considering painting your home or the outside of your home needs a spruce up give me a call and I would love to quote your house no job is too small and no job is too big my job is to make your home look like new again. House washing is done with low pressure it is called soft wash technique never used tire pressure is it will take paint off high pressure does remove mould and mildew but it grows back after a month or two how's washing Professionals use a chlorine-based biodegradable detergent to kill the mould and mildew The detergent helps clean the dirt but plays a big part in attaching the chlorine to the house. 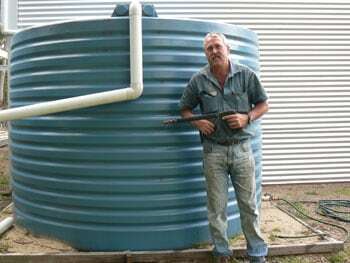 An average house uses only 260 litres of water. Only twice in over 15 years has a customer ever check the water metre before and after and both times they were very happy with the amount of water I used. 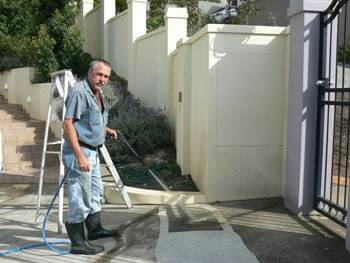 I not only clean clean houses but I can also assist with high pressure cleaning of driveways, pathways, concrete steps, swimming pool surrounds, under pergola, letter boxes and tennis courts. As houses get mouldy concrete and pavers get mouldy over the years. It can be very dangerous walking on mouldy concrete as it can be very slippery. To clean concrete the best method is to put a chlorine solution on the area and wait for a while to let the solution kill it. You can tell when it is ready to high pressure clean as the mould changes colour. Green mould turns brown whilst black mould changes to purple. I then use a high pressure machine to blast off the mould as you can see in the pictures on my gallery page. Hey presto no more slippery surfaces and the presentation of your property is greatly improved and no more harmful mould effecting your families health. I provide professional house washing and pressure cleaning services to residential customers, real estate agents, body corporate and commercial businesses. I know a lot of pension as a struggling with the day today cost of living. For as long I have operated I have vowed to keep my costs affordable while still providing exceptional service. I always do a great job and customer satisfaction is my top priority. I get many referrals for people who are happy to refer me to their freinds and family members. 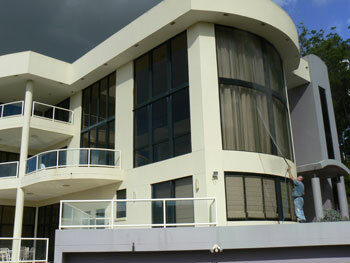 I also work for a number of real estate agents across Brisbane. They ask me to prepare the house for sale when potential buyer enters a property they see your house it looks clean and tidy. Everything from a clean house to a freshly cleaned driveway, pathways, pools surrounds and even fences can add an extra $10,00 to $20,000 to the value of a home. Tenants also like to live in a clean home so lot of owners get me to clean their homes annually to keep tenants happy and to keep their investment property clean plus it is a tax deduction for them as well. Body corporate consist of unit complexes in townhouses they can range from small for unit complex the ones with 100 units in the one off centres I always offer the lowest prices possible whilst till providing a high quality service. I always do one section of the house at a time. I hope so Windows first with water spray House Washing solution on and let it settle for a few minutes to let the solution either way mould mildew dirt and then brush with a soft Brown to remove stains that won't come off I rinse windows and then hose away. Solution and watch in amazement at how clean it becomes and then I move on to the next section and do the same if like most homes you have Gardens around your house my solution won't hurt plants for Hedges I always host them before during and after with over 15 years of experience I've never hurt one plant is a very mild solution of chlorine and biodegradable detergents. There is no need to cover air conditioning units outside of your house as they are in the rain all the time and I made to get wet fans a lot of new houses have fans on decks and it is very important not too wet these as it can cause damage blow power I always cover them and spray solution around them. Most furniture will welcome McLean from the house washing solution especially plastic tables and chairs I always give them a clean as I'm washing the house and I do this at no charge unique Timber Furniture can sometimes leak oil after washing but if you rinse first they should be fine if we are concerned I always carry a large tarp to cover furniture BBQ's are fine to leave out on decks first and afterwards no one has ever said this steak was ruined. Decks and patios are included in all of my House Washing quotes. Ceiling and balustrades, steps and under decks are included as well.Sometimes there is a small gap under front and back doors I either tape the gap or put an old towel inside on the floor. Glass sliding doors are no problem. 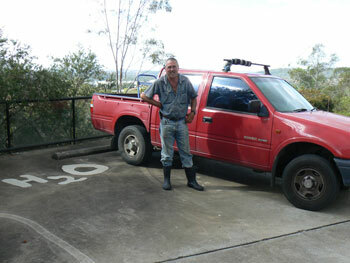 You can hire a machine but you have to get a trailer or ute to carry a machine home. Can you start the machine as they have a big kick back when pulling the starter. The cost to hire a machine can be $150 a day. Most driveway can now be cleaned for just$200 and that has a chlorine solution put on as well so you save your time and your money. You can also purchase your own machine but the small electric ones have such low power you might as well use a garden hose. Not to mention it will take you hours and hours to clean a driveway. You could purchase a professional machine which range from $3000 for a small machine with a psi rating of 100 psi to $15000 for a large unit with a 4500 psi rating.Probably the biggest reason for not attempting to pressure wash anything yourself is the fact that you can be seriously injured by the extreme pressure. You are always better off having a professional such as myself wash or pressure clean your house effectively and affordably. Every house is different. Lowset brick to lowset timber. Lowset rendered to high set brick. High set rendered and high set timber. Some have decks with lots of balustrading. Houses have 2 to 6 bedrooms. Every house is unique in their own way so an individual quote is required. With modern technology you have Google Maps Street View and you have Google type in any street name any number and up pops your house giving your pictures of the front side and back decks included it even tells you how many bedrooms you have as I live in Wynnum I get quotes from all over Brisbane from North Lakes to Jindalee to Paddington Mount Gravatt and to Everton Park with this modern technology it saves me time to quote over the Internet from Wynnum to Northlake it takes 40 minutes to drive there quite the house 10 to 15 minutes and drive back 40 minutes that's 95 minutes to quote one job one hour 35 minutes so thanks to Google I provide a cheaper quote and I can get more work done this way.